What is Business Residential College in Bear Hall? Biz@Bear is a living-learning community for forward-thinking students majoring in accounting, business administration, economics, finance, insurance & risk management, marketing, management, management information systems, public scholarship & community engagement, and innovation & entrepreneurship. Located on the 4th floor of Bear Hall, Biz@Bear fosters a culture of intellectual curiosity and community engagement. It also teaches students how to work in the real world! Biz@Bear is for ambitious students beginning in their freshman year and continuing through the senior year. 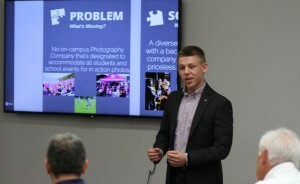 The program includes a live-in Resident Master, a dedicated classroom & UCA Core classes, and co-curricular programming developed by the College of Business to build the culture of innovation, communication, entrepreneurship, and business leadership that will grow well beyond anything that can be accomplished just by taking classes! Students to work together in teams to develop business ideas and discuss their ideas with local business leaders. 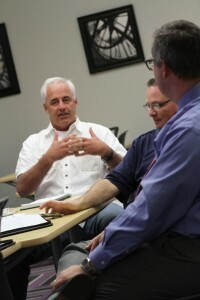 Biz@Bear students meet local entrepreneurs and learn about pursuing innovative business ideas. They are also encouraged to come up with innovative ideas to improve UCA and the community. Zach Hull (freshman) pitches his team’s business concept to the judges. Judges discuss the $20 Business Bear Challenge pitches. For more information contact: Dr. Ken Griffin, Biz@Bear Rector, keng@uca.edu, 501.852.0894 or Dr. Jayme Millsap Stone, Director of Learning Communities jaymes@uca.edu or 501.450.5148.